I live in Nanjing, just down the road from the Chaotian palace and, in the other direction, the Hanzhongmen section of the city’s ancient wall. This section of the wall is mostly in bits now, but it’s a lovely spot, opening up into an area for gathering with friends. As the sun sets on the city everyone in the local area converges on the square to do aerobic “square dance” exercises, or tai chi, or to sing karaoke into microphones that blasts out competitively from different speakers. In the winter it’s freezing with icicles like javelins hanging from the pavilion. In the spring it’s filled with plum blossoms, small singing birds in cages, but at this time of the year it’s filled to the brim with cicadas, clacking and whirring like chainsaws in the trees. In the mornings, on the way to work, it is often filled with elderly men, writing poems with water (a scene that inspired the final poem in my new collection, The AQI). A special brush is dipped into a bucket and the men write the poems using gorgeous calligraphy for the poems of Li Po, Han Shan and Du Fu. As the sun rises and the cicadas start to sing, the water evaporates into the air, lifting the poems from the pavement. Meanwhile, most people rush past on their way to work, on their way to Starbucks or McDonalds, on their way to twelve hour shifts, weighed down with family burdens, by loneliness, by the fear of being left behind. The truth is, modern China is a hustle-and-bustle place with a huge population, an economy growing at a staggering rate, people stressed beyond belief. For me this is a poem that sums up so much of contemporary life in China: the seeming unstoppability of things happening. It also covers feelings of death, of a lack of agency, of stress, of the lack of privacy. The poem is blunt, to the point, foreshadowing the inevitable; it uses “wherever”, a word that when starting a sentence ensures that that sentence has to end in a certain way. 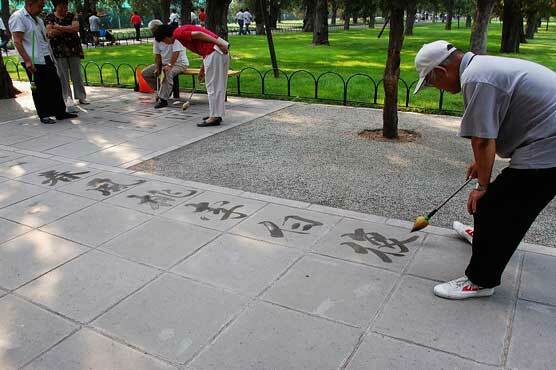 The poetry that most people will be familiar with from China will be of a more traditional school, probably akin to the poetry written by our water calligraphers. As gorgeous as those lyrics tare, the poems we will be looking at on my new course will lean further towards Sheng Xing, lyrics ingrained with the relentlessness of modern life, the pollution, the stress, rapid urban development, the pressure, poems that mark out what it is to be alive right now. I’m excited for you to join us on this course! And I promise they won’t all be about death. Rejuvenate your poems with a bold, new wave of Chinese voices on David Tait’s online course, We Cannot Stop the Rumbling Trains: Contemporary Chinese Poetry. Book online or ring us on 0207 582 1679.